Nicopolis Ad Nestum is also located 7 km east of today’s town of Gotse Delchev which is technically its contemporary successor (see the Background Infonotes below), and is just to the north of the Ilinden-Exochi Border Crossing on Bulgaria’s border with Greece. A growing number of tourists are flocking to see the Roman city founded in 106 AD by Roman Emperor Trajan (r. 98-117 AD), Garmen Mayor Minka Kapitanova says, as quoted by the Bulgarian daily Standart. The project for the reconstruction and conservation of Nicopolis Ad Nestum (meaning “Victory City on the Mesta Rivar), which was funded with BGN 2.3 million (app. EUR 1.17 million) of under EU Operational Program “Regional Development", was completed in 2014. Its goal was to create a new cultural tourism destination, and it now appears to be bearing fruit. “The influx of visitors is helping the development of our economy," the Mayor of Garmen is quoted as saying. The EU funding was used for the restoration and conservation of the fortress walls, fortress towers, and Roman Thermae (public baths) of Nicopolis Ad Nestum (not to be confused with Nicopolis Ad Istrum, another Ancient Roman city located in Central North Bulgaria). The project also created tourist infrastructure such as lighting, alleys, a visitor center, and a parking lot, as well as a “tourist train" bringing tourists to and from the nearby spa resort town of Ognyanovo whichfor its mineral springs. One of the major attractions in the restored Ancient Roman city of Nicopolis Ad Nestum is a pottery workshop where tourists are taught to make their own clay vessels. Visitors can also dress in Ancient Roman costumes, and attend different events at a small amphitheater. Nicopolis Ad Nestum is the only preserved Roman city of its kind in the Rhodope Mountains in Southern Bulgaria, and is recognized as an archaeological monument. Nicopolis Ad Nestum (also Nicopolis Ad Mestum) is an Ancient Roman city located in the town of Garmen, and close to the town of Gotse Delchev in Southwest Bulgaria (not to be confused with Nicopolis Ad Istrum in today’s Central North Bulgaria), in the western part of the Rhodope Mountains. Its name means “Victory City on the Mesta River". It was founded in 106 AD at the location of Alexandroupolis, a previously existing Ancient Thracian settlement, by Roman Emperor Trajan in honor of his victory over the Dacians, a Thracian tribe living north of the Lower Danube, in today’s Romania. Its location on a Roman route between the Aegean coast and Philippopolis (today’s Plovdiv), to the north of the Roman road Via Egnatia made it an important urban center between the 2nd and the 6th century AD. Nicopolis Ad Nestum was mentioned by Greco-Egyptian ancient geographer Claudius Ptolemy (ca. 90-168 AD). Roman coins were minted in the city during the period between the reigns of Emperor Commodus (r. 161-192 AD) and Emperor Caracalla (r. 198-217 AD). In 577 AD it was destroyed in a barbarian invasion of Slavs and Avars, and was restored in the 9th-10th century, during the First Bulgarian Empire (632/680 – 1018 AD) when it was known as Nikopol, until the 13th century when it was destroyed by crusaders. During the Late Middle Ages, it was the site of a Bulgarian settlement, and after the Second Bulgarian Empire (1185-1396 AD) was invaded and conquered by the Ottoman Turks, the urban settlement moved a few kilometers to the west and was known with its Turkish name Nevrokop. In 1951, the Bulgarian authorities named the contemporary town to Gotse Delchev after one of Bulgaria’s great revolutionary heroes from the geographic region of Macedonia, Gotse Delchev (1872-1903). Nicopolis Ad Nestum has been excavated since 1980 on an area of 13 hectares (app. 32 acres). The earliest finds date back to the Neolithic. The excavated structures include 280 meters of fortress walls, public and religious buildings, and burial mounds, as well as two Early Christian basilicas from the 4th century AD, and Roman thermae (public baths). The Roman Thermae in Nicopolis Ad Nestum were built in the 320s AD, and burned down in around 400 AD, possibly during a Gothic invasion. They were restored at the end of the 5th century, and were in use until the third quarter of the 6th century. The numerous finds exhibited in the Gotse Delchev Museum of History also feature artifacts from the Middle Ages. 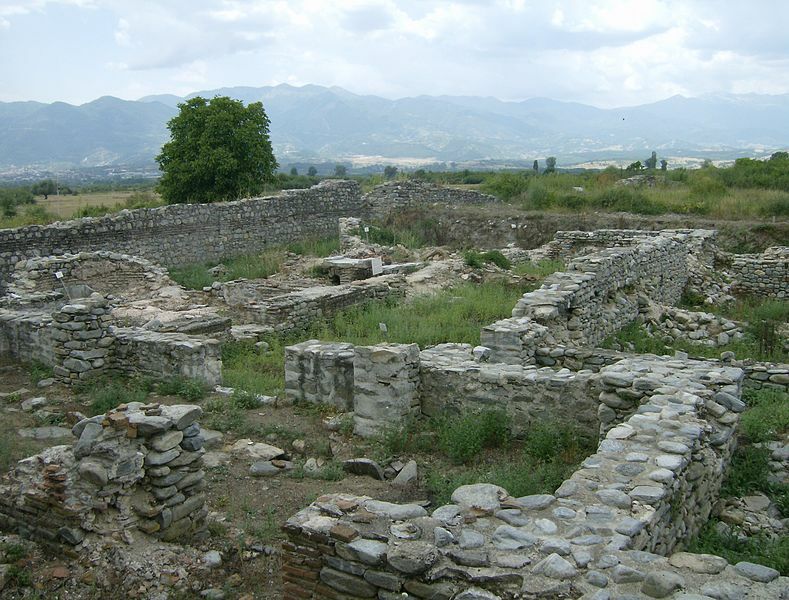 Today, the Ancient Roman city of Nicopolis Ad Nestum is recognized as an archaeological monument, and is said to be the only preserved Roman city in the Rhodope Mountains in Southern Bulgaria. In 2013-2014, BGN 2.3 million (app. EUR 1.17 million) of EU funding under Operational Program “Regional Development" was provided for the partial restoration and conservation of the city in order to turn into a destination for cultural tourism.